In the midst of South by Southwest is Austin legendary musician Willie Nelson’s music festival, Luck Reunion. 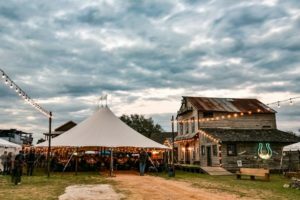 This year’s edition, taking place on Thursday, March 15, will feature a unique assortment of Texas chefs. The food lineup, put together for the Austin Food & Wine Alliance by Salt & Time’s Ben Runkle, goes beyond the usual offerings, from Indian-Texas fare (Puli-Ra) to Southern cuisine (Hoover’s Cooking), new-school barbecue (LeRoy & Lewis), high-end Mexican (Mixtli), to tacos (Vaquero Taquero). Everything will be found at what is being referred to as the Austin Food & Wine Alliance Corral. The full list of chefs follows below. The festival takes place at Luck, Texas, which is part of Nelson’s ranch. The music lineup includes Kurt Vile, Nikki Lane, Nathaniel Rateliff and the Night Sweats, and of course, Nelson himself. Luck Reunion is found at 1100 Bee Creek, Spicewood, Texas, with everything beginning at 11 a.m. Tickets will be available on a rolling basis starting sometime in early March. Profits from Luck Reunion will go towards a new grant for the Austin Food & Wine Alliance. Named the Willie Nelson’s Luck, TX grant, it will give $5,000 to a Texas chef. This entry was posted on Friday, March 2nd, 2018 at 8:59 am and is filed under Luck Reunion, Luck, Texas. You can follow any responses to this entry through the RSS 2.0 feed. You can leave a response, or trackback from your own site.